With the ability to produce high quality pull up banners on premium quality pvc greyback in a wide range of widths, Carrick Signs are the perfect choice for your roller banner requirements wherever you’re based across the UK we can supply nationwide delivery from a single unit to hundreds, we can guarantee the same great service, print and quality. Dave Grohl and his band Foo Fighters have partnered with UK based Rocksteady Music… “This is a call to all Foo Fighters fans! 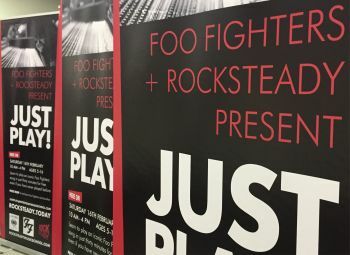 The biggest rock band in the world, Foo Fighters, are teaming up with Rocksteady to give children aged 5-16 a chance to play just like them for FREE! It’s been a privilege to work with Rocksteady Music again, and of course work alongside, albeit it loosely, the Foo Fighters for this incredible initiative. If you need roller banners get in touch today. You may not be the biggest rock band in the world but you’re still cool to us. Peoples Vote March - got your placards yet? Have you Printed your Christmas Tree yet? Copyright © Carrick Signs Ltd.
is a trade name of Carrick Signs Ltd. Copyright © Carrick Signs Ltd. Large Format Printing. www.foamex-printing.co.uk/ is a trade name of Carrick Signs Ltd. All Rights Reserved. We print foam pvc boards in Whitefield near Manchester and deliver any foamex signage to all UK locations inculding Bury, London, Birmingham, Leeds, Glasgow, Sheffield, Bradford, Edinburgh, Westminster, Bristol, Wakefield, Swansea, Southampton, Salford, Aberdeen, Cardiff, Coventry, Nottingham, Portsmouth, York, Peterborough, Dundee, Liverpool, Leicester, Sunderland, Belfast, Newcastle upon Tyne, Brighton, Hull, Plymouth, Stoke-on-Trent, Wolverhampton, Derby, Lancaster, Oxford and others. Visit our Instagram Frame Printing Website.